PRESS RELEASE For immediate release. Gilbert Stuart Painting Of George Washington An original painting of George Washington by Gilbert Stuart hangs behind the Masters chair of Fredericksburg Lodge No. 4, Fredericksburg, Virginia. In 1890, a historical sketch of the Fredericksburg Lodge No. 4, A.F.& A.M. Fredericksburg, Virginia, by S. J. Quinn P.G.M. of Virginia, states: "The older members of the Lodge cannot remember when the [Athenaeum] portrait of George Washington [by Gilbert Stuart (17551828) one of the most famous portrait artists of his time] did not hang in [the] rear of the chair of the Worshipful Master and as we now have as many as two members who were Masons and members of the Lodge more than 50 years ago, it is quite likely, from the reports the older Freemasons before them gave of it, that the painting was executed for the Lodge during the lifetime of Washington." Stuart made 104 or more likenesses of George Washington. The paintings are grouped into categories named after the first owners of the original portraits from which Stuart made his own replicas: the Athenaeum portrait (Washington facing to his right; see above and inside front cover), the Vaughan portrait (facing to his left), and Lansdowne (full-length). With a letter of introduction from Justice John Jay, Stuart was granted his first sitting from George Washington at Philadelphia, then the capital, in March 1795. The President, then 63 years old, grumbled about the drudgery of posing, and all of Stuarts wit and wisdom failed to interest him. The artist claimed that "an apathy seemed to seize him, and a vacuity spread over his countenance, most appalling to paint." Nevertheless, this canvas, the Athenaeum portrait, has spontaneity because of its relatively quick, sketchy painting technique. The warm tan underpainting shows through the thinly brushed hair, while slashes of pigment model the black queue ribbon and form the highlights of the collar and cravat. To impart Washingtons imposing six-foot, two-inch stature, Stuart placed his head high in the design, as though the President towered above the viewer. Finally, Stuart surrounded Washington with a fiery, halo-like glow. The portrait was saved during the Civil War by a member of the Lodge. A senior member of the Lodge in 1890 recalled that "one of the members went into the Lodge-room after the work of destruction was over and the pillagers were gone, and found this painting lying on the floor in the dirt and rubbish. He took it up and carried it to his home, where he kept it until the reorganization of the Lodge after the war, when it was restored to its accustomed place in the Lodge-room, where it now hangs." In the minutes of the Lodge for March 10, 1905, Bro. C. R. Howard from the committee on the Washington Portrait reported: "This Committee begs to report that the portrait of Washington was taken from the frame and carried to the Corcoran Gallery of Art in Washington City. Through the courtesy of Mr. F. B. McGuire, the Director, and Mr. C. P. Minnegerode, the Assistant Director, the portrait has been examined by the most expert critics on the work of Gilbert Stuart. Mr. F. B. McGuire, who has made a special study of Stuart and his paintings, on first examination pronounced our portrait a copy of Gilbert Stuarts Washington, but added that after studying the portrait more fully and carefully, examining [it] every day for about two weeks, he altered his opinion and pronounced it beyond doubt as the original work of Stuart. He thinks that at some time portions of the portrait have been retouched by some unknown artist. Prof. A. F. Andrews, an artist of note, who had copied a number of Gilbert Stuarts portraits, is of the same opinion as Mr. McGuire, and said to one of your Committee, that the portrait could not have been painted by any other hand than that of Stuart. Mr. T. G. Fisher, a prominent art dealer, also pronounces the portrait as an original. The letters of Mr. McGuire, Prof. Andrews, and Mr. Minnegerode are attached to and made part of this report.... Respectfully submitted, Clarence R. Howard, Com." Given the above, it is clear that this authentic Portrait by Gilbert Stuart has been hanging in Fredericksburg Lodge for close to 200 years and was probably placed there upon its completion during the lifetime of Washington. The portrait continues to be displayed in the current residence of Fredericksburg Lodge and museum and is protected by the confines of a safe and security system. It is a prized possession of the Lodge, not only due to the historical nature of both Washington and Stuart, but because George Washington became a Mason in that Lodge. Washington was received an Entered Apprentice on November 4, 1752, was passed to the Degree of Fellowcraft March 3, 1753, and raised to the Sublime Degree of Master Mason on August 4, 1753. Although few records exist from that time, it is interesting to note that Fredericksburg Lodge, constituted prior to 1752, is one of the oldest Lodges in North America. From its organization until 1756, the Lodge met "over the Market House." It changed locations three times until the current Lodge building was completed in 1815 where the Lodge has met ever since. Gilbert Stuart grew up in Newport, Rhode Island, where he studied painting before going to London in 1775. There he became a pupil of the expatriate American painter Benjamin West and was much influenced by the work of the English portrait painters Thomas Gainsborough and Sir Joshua Reynolds. In 1792, after establishing himself as a fashionable portrait painter in London and Dublin, Stuart returned to the United States. His portraits, which number nearly 1000, brought him lasting fame, particularly the three he did of George Washington. Stuart also did portraits of Presidents John Adams, Thomas Jefferson, and James Madison as well as paintings of the British monarchs George III and George IV. During the course of photographing the original painting in order to produce a lithograph, I had the opportunity to study the portrait carefully. It presents a captivating image of considerable depth and many nuances. The poster comes close to revealing Washingtons soul. Dont miss visiting Fredericksburg Lodge and viewing the original portrait! 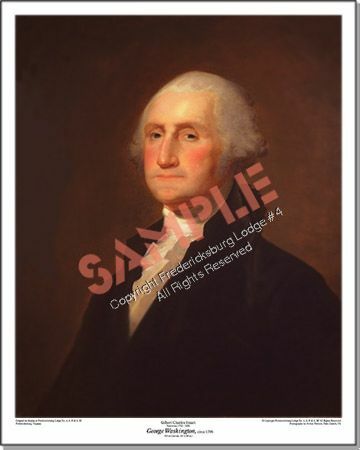 For the first time in the 200-year history of the Washington portrait by Gilbert Stuart in Fredericksburg Lodge No. 4, a high quality, four-color limited and numbered edition lithograph (24"x30") has been produced for the Lodge. Prints are on sale at the Museum Gift Shop of the Lodge or, to order by mail, send $56.00 (check or money order only) to Fredericksburg Lodge No. 4, A.F.&A.M., Gilbert Stuart Portrait, PO Box 702, Fredericksburg, Virginia 22404. Virginia residents add $2.25 sales tax. With permission, Bro. Arthur W. Pierson, 32° , compiled this article from historical information provided by the following sources: the minutes of Fredericksburg Lodge No. 4; Historical Sketch of Fredericksburg Lodge No. 4, pub. 1890 by S. J. Quinn, P.G.M. of Virginia; National Gallery of Art, Washington, D.C.; Microsoftâ , Encartaâ , 1996 Encyclopedia; Freemasonry and the Lodge at Fredericksburg by Robert W. Benish.